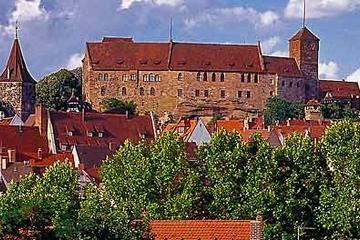 The ancient city of Nuremberg (Nürnberg) is an important center for arts and culture. The city has also long been associated with advances in science and technology, particularly in printing - it was home to Europe's first printing press - and astronomy (Nicolaus Copernicus's most famous work was published here in 1543). Despite having been severely damaged in WW2, many of the medieval buildings in the Old Town (Altstadt) have been painstakingly restored to their former glory. In fact, most of the top attractions in Nuremberg are located within the historic walls, which extend some five kilometers around the Old Town. You may want to plan your visit to coincide with one of Nuremberg's many festivals. Two favorites are the famous two-week long Old Town Festival musical and folk event, and International Organ Week, which runs from late June to mid-July. Plan more with our list of top attractions in Nuremberg. Dominating the skyline of the northwestern section of the Old Town (Altstadt) rises the cluster of historic structures that together comprise Nuremberg Castle, the Imperial Castle of Nuremberg (Nürnberger Burg), to give its full name. This impressive 351-meter-tall fortification is considered to be one of the most important surviving medieval fortresses in all of Europe and was the residence of all legitimate German kings and emperors from 1050 to 1571. A great way to get the most out of a castle visit is to join a fun walking tour of Nuremberg Old Town. These two-hour tours also take in other important landmarks along the way such as city walls, the famous Hauptmarkt, the historic Albrecht Dürer House, and St. Lawrence Church. At the lower end of the castle are the imperial stables built in 1495 (now a youth hostel), and the Pentagonal Tower, dating from 1040. Higher up is the Kaiserburg, built in the 11th century (although much altered in later centuries), along with the Sinwell Tower with its wonderful panoramic views. Be sure to spend time exploring the Palas quarters with its unique double chapel, both of which date from the early 13th century (English-language audio tours are available for a small fee). Many surviving artifacts from the castle's long history can be viewed in the Imperial Castle Museum, the Bower. Here, you'll find an impressive collection of medieval weapons and suits of armor, along with saddles and harnesses. Another of the castle's top must-sees is the famous Deep Well. Located in the attractive old two-story Well House built in 1563, this even older manmade structure plummets to a depth of 50 meters, and can only be visited with a tour guide (tours available every half hour). Be sure to also explore the impressive Castle Gardens, an attractive place for a stroll, which can trace its roots all the way back to 1525. The National Germanic Museum (Germanisches Nationalmuseum) is home to the country's largest collection related to German art and culture. The museum has more than 1.3 million items relating to the region's artistic and cultural history, including historical documents on parchment, a collection of 17,000 seals, and a superb fine arts archive. Other notable highlights include a collection of 300,000 prints and drawings, paintings representing all the major schools, historical musical instruments, a sculpture collection, and a fascinating display of antique toys and dollhouses. Part of the fun of exploring this vast museum is taking in its many unique architectural features as it incorporates an interesting mix of historic and modern buildings, including parts of a 16th-century charter house and a former abbey. The museum is also worth visiting as it's located on Kartäusergasse, where you'll find The Way of Human Rights (Straße der Menschenrechte), a street-long monument dedicated to world peace. Another notable art-related attraction is Kunsthalle Nürnberg, a popular gallery that features exhibits of work by contemporary international artists. Nuremberg has the unique distinction of having preserved most of its circuit of old city walls, many dating from the 14th to 15th centuries and later strengthened in the 16th and 17th centuries. A fun thing to do is to walk the nearly five kilometers of paths that follow the walls, leading you to numerous gates and towers, many of which can be explored. The finest stretch of walls is on the west side of the town, between the massive Spittlertor and the former Maxtor, while the best views of the walls, the old town, and the Burg can be enjoyed from the Fürther Tor. For a completely different tourist attraction, be sure to visit the nearby Medieval Dungeons with its 12 prison cells and torture chamber (guided tours are available). Just outside the old town walls is the superb Nuremberg Transport Museum (Verkehrsmuseum Nürnberg). Consisting of a number of museums, including Deutsche Bahn's (the country's railway) DB Museum and the Museum of Communications, it's a wonderful attraction to explore with kids due to its many displays relating to the country's railroads. Highlights include numerous scale models, including a massive model railway that's been built up for over 100 years, as well as a variety of fun interactive displays. One of the oldest such museums in Europe - it can trace its roots back to 1899 - its collection also includes royal trains and perfectly restored steam and diesel engines, as well as a working replica of Germany's very first train. The museum also offers a varied program of tourist and charter trips on mainline rails, so be sure to check for such opportunities prior to your visit. And for a truly memorable oracle experience, check the availability of one of the excellent tourist charter trains, which run regularly. Another transportation-related museum to check out is the Merks Motor Museum, which houses a fine collection of some 90 vintage cars. Overlooking Lorenzer Platz, the spectacular twin-towered 14th-century Gothic church of St. Lawrence (St. Lorenz, or Lorenzkirche) is the city's largest church. One of its many notable features is a large rose window, nine meters in diameter, situated above the beautiful west doorway. Inside, its many lavish works of art - most of them provided by the city's richer classes over the centuries - include the Annunciation by sculptor Veit Stoss from 1517 in the choir; its late 15th-century tabernacle; the crucifix on the high altar; the Krell Altar, with the oldest surviving representation of the town; and the superb stained glass in the choir dating from 1477. Other notable features include a unique three-part organ boasting over 12,000 pipes, which is said to be one of the largest such instruments in the world, and a set of 16 bells, the oldest of which dates back to the 1300s. Nearby highlights include the Fountain of Virtue from 1589 and the 13th-century tower-like Nassauer Haus. For centuries the scene of a daily market, the Wochenmarkt, that continues to this day, the Hauptmarkt is home to the aptly named 14th-century "Beautiful Fountain," with its ornate decorations and figures (be sure to touch the fountain's famous gold ring for a spot of good luck). It's also where you'll find the Old Town Hall (look behind its much newer 20th-century counterpart) built in 1616 and notable for its magnificent doorways, dungeons, and torture chamber. Between the two buildings is another famous fountain, the Gänsemännchen, built in 1555 and depicting a Franconian peasant carrying two geese, with the water flowing from their beaks. It's in the Hauptmarkt that Nuremberg's famous Christmas Market (Nürnberg Christkindlesmarkt) is held, a two-week extravaganza attended by more than a million visitors, which sees the marketplace transformed by festivities and lighting, as well as stands selling ornaments, Christmas foods, and gifts (exploring its many stalls is a particularly fun thing to do at night). It's also here that you'll find St. Giles' Church, the city's only Baroque church. The Roman Catholic Frauenkirche (Church of Our Lady) dates back to 1352 and is a must-see Gothic landmark you won't easily miss when visiting Nuremberg's Hauptmarkt, as the building's stunning facade is rich with detail. For example, above the porch with its rich sculptural decoration is the Männleinlaufen, a beautiful old clock that was installed in 1506 with mechanical figures representing the seven Electors pacing round Emperor Charles IV (performances daily at noon). Notable features of the interior - designed with attendance by the Emperor in mind - are the Tucher Altar from 1440 and two handsome monuments by Adam Kraft. Visitors are welcome to attend daily mass here, too. In the pedestrian-friendly Jakobsplatz is another interesting old Roman Catholic edifice, the domed St. Elizabeth's Church built between 1785 and 1806. Protestant St. Sebaldus Church (Sebalduskirche), built from 1225-73, boasts a magnificent Gothic east choir dating from 1379 featuring the Schreyer-Landauer tomb, the work of Adam Kraft. Inside, on a pillar in the north aisle, is the Madonna in an Aureole dating from 1420, while in the east choir is the famous tomb of St. Sebaldus from 1508, a masterpiece in bronze by Peter Vischer and his sons (a silver sarcophagus from 1397 contains the saint's remains, and Vischer himself is depicted with his leather apron and chisel). Other church highlights include a Crucifixion group by Veit Stoss dating from 1507 and a huge organ with 6,000 pipes. A great experience if you're able to squeeze it into your Nuremberg itinerary is to participate in a private 1.5-hour tour of the church's towers; spaces are limited for this twice-weekly event, so arrive early to purchase your tickets. Another protestant church of note is the 14th-century St. James's Church (Jakobskirche) in the Jakobsplatz pedestrian area. Just a stone's throw from Nuremberg Castle is the 15th-century Albrecht Dürer's House (Albrecht-Dürer-Haus), where the famous German Renaissance artist lived from 1509 until his death in 1528. The five-story house itself dates back to 1420 and now serves as a museum, founded in 1871 and dedicated to Dürer's life and work (he was especially famous for his printed maps). In addition to its many fine displays of some of his best known creations, the museum houses displays of authentic period furniture and a reproduction of Dürer's studio workshop, where demonstrations of traditional printing can be enjoyed. Also of interest is the kitchen with its original fireplace plus living quarters, which can be viewed. Guided tours are available. Also of note is the nearby Tiergärtner Tor, a perfectly preserved little medieval square. Another famous old home is the late 16th-century Fembohaus, the town's best preserved old merchant's house now occupied by the Heimatmuseum with its domestic interiors and displays relating to the town's history. The Documentation Center Nazi Party Rally Grounds (Dokumentationszentrum Reichsparteitagsgelände) is one of Germany's most important museum's dedicated to the bleakest chapters in the country's history. In a wing of the Congress Hall where Nazi Party rallies were held, its most notable exhibit is called Fascination and Terror and deals with many facets of the Nazi regime's brutal time in power. Covering an area of 1,300 square meters, it deals specifically with the impact of the regime on Nuremberg (the Congress Hall was part of a vast 11-square-kilometer site), as well as the Nuremberg Trials that took place here after the war. Guided tours are available in English with advance notice, and English language audio tours and video displays are also provided (you can also pick up details of a self-guided tour of the complete rally grounds). Another point of interest related to this dark period of German history is Memorium Nuremberg Trials, a fascinating exhibition concerning the war trials that took place here after WW2, and which is located above the actual court used at the time. If you are on a tight schedule, consider joining an organized walking tour of the Nuremberg Nazi Rally Sites that also takes in the best of the top Old Town (Altstadt) attractions. In addition to learning the remarkable history of this medieval city - both ancient and modern - you'll see points of interest such as the Imperial Castle courtyards, Albrecht Dürer's house, and St. Lawrence Church during this informative four-hour tour. Nuremberg's St. Lawrence Side, or Lorenzer Seite - named after its principal church, St. Lorenz - lies in the section of the Old Town (Altstadt) that's located on the south bank of the river Pegnitz. One of the busiest parts of the city, it's worth exploring for its famous Frauentorturm and Handwerkerhof Alt Nürnberg districts, two small enclaves of wonderful, old half-timbered houses renowned for their traditional craft workshops. From Bahnhofsplatz, the busy Königstrasse runs northwest into the old town of Nuremberg. Highlights of this historic old street include the 14th-century St. Martha's Church (Marthakirche) with its fine stained glass. Nuremberg's excellent Toy Museum (Spielzeugmuseum) - widely regarded as the leading museum of its kind in the world - is a fun attraction for kids of all ages... and adults. It's located in a historic old home dating from 1517. Highlights of a visit include fascinating details of the cultural significance of the many unique toys on display from different countries and periods. Many of the older toys, some of which date back to medieval times, were made in the town, which was famous for centuries for its doll makers. Also of note is the world's largest collection of toys made by EP Lehmann, one of the country's best-known toy manufacturers, famous for their line of model trains, some of which can be seen traveling along the museum's large model railroad layout. The Toy Museum is also home to the German Games Archive, a vast collection of board games and other related materials. On-site amenities include a well-stocked toy store, an outdoor play area (including a labyrinth), plus an indoor play and craft area. For those with an interest in the stars, a visit to the Nicolai Copernicus Planetarium is another fun thing to do with the kids. Another fun thing to do for those traveling with kids is to pay a visit to the Nuremberg Zoo (Tiergarten Nürnberg). Home to more than 2,000 animals from some 300 or so different species, this world-class attraction was opened in 1912 but can trace its roots back to medieval times, when exotic animals from around the world were kept for entertainment by local aristocracy. Covering an area of 170 acres, it's one of the largest (and oldest) zoos in Europe and boasts numerous displays of animals, including Siberian tigers, Asiatic lions, snow leopards, lowland gorillas, and African buffalo. It's certainly a fun attraction to stroll around, due largely to the care and attention paid to the enclosures, which are spacious and reflect natural habitats and landscapes. As well as the lush greenery, there are also many life-size bronze animal sculptures sprinkled throughout the facility. Other notable features include a popular dolphin lagoon with regular shows. If possible, try to plan your visit to coincide with the chance to see animals being fed. English language guided tours are also available. For art lovers, the excellent Neues Museum Nürnberg is a must-visit for its large and impressive collection of modern and contemporary art. Located in a very stylish building, this world-class museum opened in 2000 and is in fact something of a work of art itself, boasting bright open spaces, clean lines, and interesting architectural features such as its exquisite spiral staircase. The artwork covers the period from 1950 to today, with notable exhibits of applied art and fine art often displayed side by side to add a unique perspective to the experience. Numerous temporary exhibits are hosted throughout the year featuring works by both local and international artists. A variety of educational opportunities are also on offer, including workshops and lectures, as well as events such as music concerts and performances. Guided tours are also available and can be customized to suit your interests. After spending time exploring beautiful Nuremberg (or possibly even before you venture too far), you'll no doubt want to know more about the city's rise to prominence over the years and how it came to be home to so many important historic attractions. If so, be sure to make time for a visit to the superb City Museum in Fembo House (Stadtmuseum im Fembo-Haus). Situated in the city's last remaining Late Renaissance merchant house, the museum provides an in-depth look at life in Nuremberg and its residents over the centuries. Highlights include a chance to see a variety of original rooms, from medieval times to the 18th century, complete with authentic furnishings and artwork, as well as one of the finest surviving stucco ceilings in Germany. Also of note is the excellent wooden scale model of Nuremberg's Old Town (Altstadt), and a recreation of a traditional map printing workshop. Be sure to tune into the well-produced and informative "audio plays" put together by the museum, which use real life experiences of city folk through the years to paint a fascinating aural picture of Nuremberg's rich history. Located just steps away from the German National Museum is the Museum of Industrial Culture (Gewerbemuseum). Focusing on the city's industrial past - and housed in a former 19th-century ironworks - the museum takes a unique look at how the various industries based here through the centuries impacted Nuremberg culturally and socially. Highlights of this large facility are displays of old machinery and manufactured goods, including domestic appliances and vehicles, along with a cinema. The same building also houses the Motorcycle Museum, which celebrates an industry that started in Nuremberg in 1901. A particular focus is placed on the local Zündapp brand, which came to prominence in the 1920s with one of the first affordable models on the market. Other highlights include displays of historic racing bikes and customized machines. Luxury Hotels: Within the old town walls, near the main train station, the historic Hotel Victoria and the charming boutique Hotel Drei Raben are both steps away from the Hauptmarkt. In the latter hotel, each room is uniquely themed with a story that celebrates the city's heritage. If you prefer big hotels, the Sheraton Carlton Hotel Nuernberg is outside the walls of the Old Town but still within walking distance to the historic attractions and the main train station. Mid-Range Hotels: In a fantastic location right on the Hauptmarkt, Sorat Hotel Saxx accommodates guests in cozy, contemporary rooms, a five-minute stroll to shops and restaurants and less than 10 minutes on foot to Nuremberg Castle. Another great-value boutique option is the art & business Hotel, with bold, modern art and contemporary spaces, just outside the old town walls near the main train station. With a fitness center and a free hot breakfast, Hampton by Hilton Nuremberg City Centre is also outside the city walls, but still within walking distance to the Old Town's top attractions. Budget Hotels: On a quiet side street within the old town walls, the family-owned PrivatHotel Probst offers clean, bright rooms with comfy beds and a wonderful cooked breakfast. A hop, skip, and a jump away, the Ibis Nuernberg Altstadt offers clean basic rooms in the heart of the Old Town, while the B&B Hotel Nuremberg-Hbf is less than 15 minutes on foot from the Hauptmarkt and a short stroll from the main train station. There's plenty of fun attractions suitable for kids within a short drive from Nuremberg that make easy day trips. One of the newest is Playmobil FunPark. Tucked away in the town of Zirndorf, an easy 30 minutes' drive west of Nuremberg, this indoor/outdoor theme park is suitable for ages three and up. Highlights include full-size (kid-size!) replicas of the toy company's many famous play characters and accessories, from a giant pirate ship to a large castle, that can be explored. Other notable features include an American Indian village, a Wild West themed area, a farm, a gold mine, and even a dinosaur display. Many of the exhibits are there to be played with and climbed over, such as the ropes course, a labyrinth, and powered paddleboats, which really add to the enjoyment factor. Numerous seasonal events and mini-festivals are held here, too, so be sure to check the site's website for details. And after all that fun playing, head over to Kristall Palm Beach waterpark in nearby Stein, a popular spot for its many swimming pools and slides (plus facilities for parents, including spas and hot tubs). Located just nine kilometers north of Nuremberg, Schloss Neunhof is a lovely old fortified manor house that was first mentioned in historical documents in 1246. One of the best preserved of the mansions of the Nuremberg patricians, it is one of 60 such structures dotted around the city as a defensive line. The well-preserved building boasts a moat and drawbridge, lovely decorated interiors, as well as a splendid garden. Other notable highlights include its original gate, a variety of outbuildings including a stables and gardens, and two kitchens. A later addition worth popping into is the 18th-century chapel. The small Baroque town of Erlangen lies a few kilometers north of Nuremberg and is famous for its university. Its most notable building is Erlangen Schloss, built in 1704 and occupied since 1825 by the Friedrich Alexander University. To the rear of the building is the Schlossgarten, a delightful formal gardens designed partly in French and partly in English styles, with its lovely yet curious Huguenot Fountain, and the beautiful Orangery dating from 1706. On the north side of the gardens are the Botanic Garden and the Margravial Theater, as well the University Library, which possesses valuable manuscripts and works of graphic art, including self-portraits by Dürer and Grünewald. Less than an hour's drive from Nuremberg, the Domplatz in the town of Eichstätt is home to the Romanesque/Gothic Eichstätt Cathedral dating from the 11th to 14th centuries. The cathedral is one of Bavaria's finest medieval churches. Behind its Baroque west front is a choir with a canopied altar containing the remains of St. Willibald, the first bishop of Eichstätt, as well as a seated figure of the saint by local sculptor Loy Hering. Other cathedral highlights include the stone Pappenheim Altar in the north transept by Veit Wirsberger (circa 1495); a two-story cloister, dating from 1420-30; and the splendid two-aisled hall of the 15th-century Mortuarium on the cathedral's southeast side. The cathedral also boasts one of the largest groupings of bells in Germany, with a total of 18 available for use (though they are rung in four groups). The oldest, named Our Lady, (Frauenglocke), dates as far back as the early 1300s, as does the Death Bell (Sterbeglocke), used only when a member of the congregation has passed away. 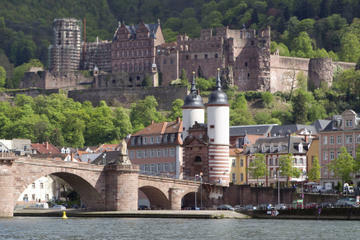 Go West: From Nuremberg, point your car northwest (or jump on a train and go that way) and you'll find yourself headed in an almost straight line to three equally interesting cities: Würzburg, Frankfurt, and Bonn. The attractions of Würzburg are an easy hour's drive away in the Main valley and include elegant old architecture (check out the Würzburg Residenz) and pleasant gardens (the Hofgarten), as well as a splendid cathedral. Frankfurt, for its part, is a must-visit for its beautiful old city center, the Römerberg, one of the most picturesque such settings in all of Germany for its old timber-framed buildings overlooking wide public squares with their pleasing monuments and fountains. Bonn, too, boasts an equally charming historic ambience, in particular around its old cathedral and nearby market square. Germany's Big Cities: Thanks to its high-speed rail network and fast autobahns, Germany is an extremely easy country to get around. Use one of these methods to visit some of the country's largest cities, including Berlin, the capital, where you'll be inundated with opportunities to be entertained while enjoying cultural activities, including visits to some of the world's leading art galleries and museums, as well as having the chance to see what's left of the infamous Berlin Wall. Hamburg is Germany's second biggest city, and is a popular destination for its magnificent port area, as well as the great family attraction, Miniatur Wunderland, the world's largest model railway. The city of Munich, the country's third largest municipality in terms of population, is of course famous for its cathedral and churches, its many palaces, as well as its gardens, all of which are pleasant to explore. A Change of Scenery: Thanks to its size, Germany boasts a wide range of great scenery to enjoy. Some of the best views can be found in the state of Bavaria, popular for its alpine region and home to the magnificent Zugspitze mountain, beautiful Lake Constance, and the thick Bavarian Forest. Winter sports enthusiasts will want to head to Garmisch-Partenkirchen, a mountainous area that's equally popular among climbers, hikers, and mountain bikers in the warmer months. Those looking for a beautiful river-like setting should check out the exquisite Mosel Valley, a delightful region of gentle sloping hills, wide, meandering rivers, and historic old towns and villages just waiting to be explored.